for Laser and Inkjet Printers, 1¾" x 5½"
Make it an event to remember and create professional-looking tickets from your own computer. 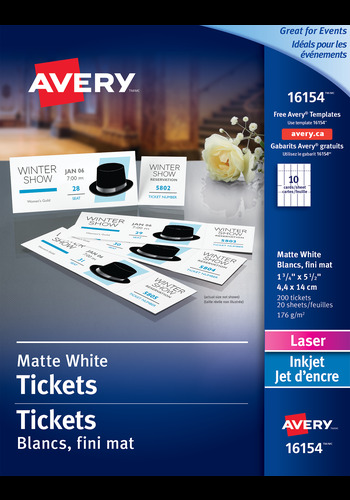 Avery® Tickets with Smooth edges and Tear-away Stubs are great for fundraisers, trade show giveaways, raffles, door prizes, bake sales, school or church events and more. Use our free Design & Print Online Software to personalize the tickets and tear-away stubs to suit your event with sequential ticket numbering. Make it an event to remember and create professional-looking tickets from your own computer. Avery® Tickets with Smooth edges and Tear-away Stubs are great for fundraisers, trade show giveaways, raffles, door prizes, bake sales, school or church events and more. Use our Free Avery Design & Print Online Software to personalize the tickets and tear-away stubs to suit your event with sequential ticket numbering. Tickets are produced on sturdy, bright white card stock and include strong perforations on the tear-away stubs to ensure they will stay put until your event. Print on one or both sides with either a laser or inkjet printer. Easily separate tickets from one another cleanly after printing with no scissors or blades. Give your next event a professional edge and create your own tickets. Card Size 1¾" x 5½"
Online templates include automatic sequential ticket numbering. Keep track of tickets sold for book-keeping needs or use ticket numbering for raffles and draws. Perforations are strong and durable to ensure the ticket stubs stay attached until the event. Sturdy, high-quality card stock to help tickets withstand regular handling. Ultra-fine microperforations allow you to easily separate tickets from one another without the need for scissors or a blade and without damaging neighbouring tickets. Create exceptional and personalized invitations or tickets for events and parties. Great for concerts, fundraisers, dances and more. A perfect addition for trade shows, raffles, door prizes and company giveaways.